Specially designed boarding and lodging facilities for in-house camps, Meditation, Yoga and other events are available at the Spiritual Growth Centre. It has 2 Dormitories, one each for ladies and gents, with a total capacity of 20 beds in each Dormitory. 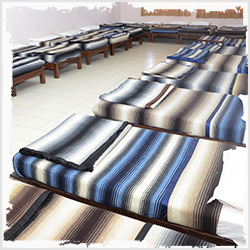 The fully furnished Dormitory accommodation with high quality linen is available for the organisers and participants of various events arranged at the Spiritual Growth Centre as well as other devotees.